2. Replace the air cleaner filter. 3. Lock the cover with the cover attaching clips. Replace the filter according to the Scheduled Maintenance Section. Use a Hyundai genuine part. 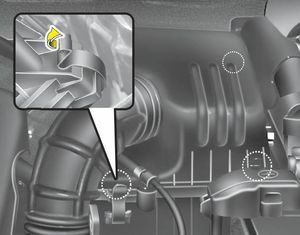 Use of nongenuine parts could damage the air flow sensor.